While shopping online is my favourite way to make my purchases, at Christmas time, I love to venture into town for a spot of Christmas shopping. There’s just something about the festive spirit in store that cannot be recreated when shopping at home. Maybe its the beautiful decorations, the twinkling lights or Mariah Carey’s All I Want For Christmas Is You song playing on loop. Either way, I love it and always take a little time out of my schedule for a wander around the shops. Late night shopping makes this even easier and I’m lucky in that all of the shopping centres near me are extending their opening hours, ready for the big man coming. I recently visited The Bridges Shopping Centre in Sunderland to discover the beauty treats that they have in store for shoppers this Christmas. Shopping for beauty in store rather than online definitely has its advantages as you can see and feel the products before buying them so you’re not going to get any surprises compared ordering online. Its so much easier to check the shade of a beauty product and to see how large or small items are, plus you can pick the brains of the store staff to get recommendations for that family member who is always so hard to buy for! The Bridges has some fantastic places to shop for beauty treats this Christmas and I’ve compiled a list of the best places to go and what to look out for when you’re there. 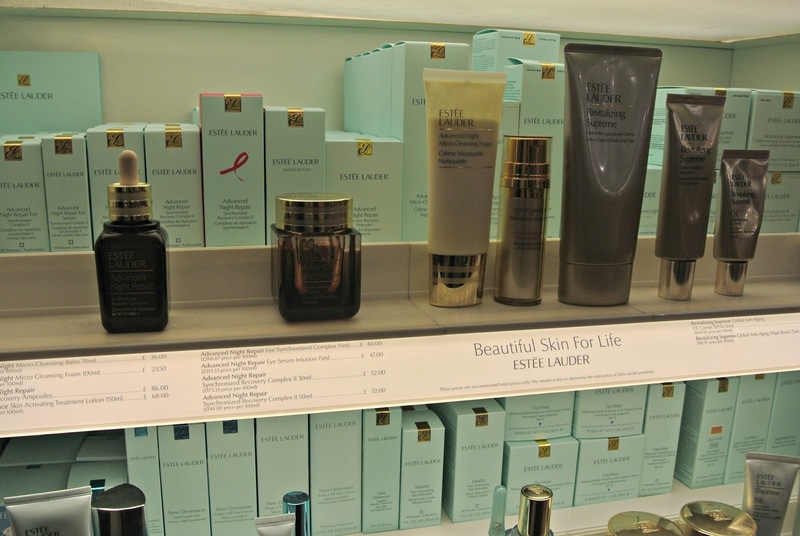 If you’re looking for higher end beauty then the best place to head to in The Bridges is Debenhams department store. As well as a huge perfume department, they have lots of counters with so many of my favourite brands from YSL and Clarins to Benefit and Urban Decay, each with knowledgable staff on hand to make Christmas shopping a doddle. One of my favourite counters has to be Estée Lauder. They’re offering skincare consultations to make sure you’re using the best products for your skin at this time of the year as well as mini makeovers targeted at specific areas of the face. Struggle with creating a smokey eye ready for your Christmas party? Book in! For me, Christmas is a time that many people like to stock up on their higher end beauty faves and Estée Lauder is definitely the place to do that at. I’d recommend their skincare the most as they have some products that are a fail safe bet. The Estée Lauder Advanced Night Repair serum is suitable for all skin types and has been a firm favourite worldwide for YEARS. I’ve used the serum and ANR eye for many years and can attest to how amazing they are. I’d highly recommend picking up one of their gift sets for someone who you really want to spoil this Christmas as they’re a great way for someone to try out lots of new products from the brand. If you already know that they love ANR then treat them to a large bottle, to give them great skin everyday for the year ahead. For me, I’ll be popping a pot of the Advanced Night Repair Intensive Recovery Ampoules on the top of my Christmas wishlist. These are an intense hit of ANR that you can use weekly or as needed for an added boost. I’ve been trying out some samples that Laura on the counter gave me and they work amazingly well. I love it when counters have such knowledgeable staff like Laura as they give you so much confidence when shopping. If you know what the person you’re buying for likes already, head to the counter and the representative will help you to pick out that item or complimentry products and if you don’t know what they already use then there’s always products that are a hit with most people from each brand which are a pretty safe bet. Estée Lauder have a fabulous range of makeup products too. Unless you know precisely what shade to buy for base products, I’d stay clear of those and instead treat someone to a colour product. Take along a photo of the person you’re buying for or let one of the sales assistants on the counter know what colour eyes and hair they have and they’ll be able to recommend shades that should suit them. If you’re REALLY wanting to spoil someone this Christmas, then take a look at The Makeup Artist Collection which is a steal at £58 (£340 value!!) with the purchase of any fragrance. Debenhams are also fantastic for none beauty gifts too. I buy my Dad his slippers, PJs and dressing gown from here every year and they always go down a treat. Their alcohol themed gifts are great too; I’ve picked up a couple for one of my best friends and her husband and I just know she’ll find hers Instagram worthy. If you’re looking for makeup that feels high end but is actually at a really affordable price point then you’ll want to be heading to Kiko. There are loads of Kiko reviews on my blog as I’ve been using their products for years but they’ve just opened a store in Sunderland. I can’t tell you how great it is to be able to go into store to swatch products and try them out before I buy them! I’ll have a full post on my top picks from Kiko coming up soon but your best bet for shopping is to go in store with an idea of a look that you’d like to create and then shop for that look. A few eyeshadows and a lipstick for a friend who loves nudes and a brown smokey eye, packaged in a gift box from Clintons would make a really lovely gift without breaking the bank. Kiko even offer complimentry makeovers in store if you’d like to try something out for yourself, perhaps before a Christmas party! Alternatively, if you’re looking for a store thats going to give you the best of both worlds, then check out Boots. Although their range of higher end beauty counters is limited in the Sunderland store, what they do have is good and their huge selection of the best drugstore brands certainly make up for it. Head upstairs to the Boots Emporium as that’s where the magic really is. Here you’ll find customisable eye and blush palettes that you can put together yourself by selecting the shades you love from the vast selection on offer. Better still, you can have the palette engraved with a message of your choice which would transform a great gift into a fabulous one. You simply cannot go wrong with a personalised beauty present and Boots have so many different options to choose from; they’re even popping names onto makeup brushes! For as long as I can remember, The Body Shop has been a firm favourite in our household for Christmas gifts. Every year they pull out all the stops with a great range of gifts in gorgeous packaging to suit all budgets. If you’re looking for stocking fillers or Secret Santa gifts then check these out and for a gift that’ll wow, then check out the Spiced Apple Festive Tin. The packaging alone is so eye catching and would make a great storage pot, plus the products inside smell absolutely incredible! For the person who you really want to spoil, the Spa of the World Luxurious Body Collection is my top recommendation. It contains the most luxe feeling products they’ll be feeling like they’re in a top spa right from the comfort of their own home. The final place I’d recommend for beauty in The Bridges has to be Lush. We have a tradition in our house that on Christmas Eve, we each have a bath with a Lush bath bomb. We always go into Lush just before Christmas and pick out one for one another. Lush staff are always so knowledgeable and eager to recommend their limited edition creations and because everything is laid out in front of you, you can smell it and often see a demonstration to see if you’ll really like it before you buy. I love the Lush gift sets that are out this year. When I worked in an office, I used to buy one of their smaller gift sets like this one as a Secret Santa present; they’re under a tenner and you get a substantial, beautifully wrapped present for your money. The gift sets that are top of my list this year though are the Santa’s Little Helper gift set which contains a bath bomb, bubble bar, fun and shower jelly and the Snow Fairy gift set which contains four sweet smelling goodies. With so many gorgeous gifts to choose from, you’ll be spoilt for choice on the highstreet this year. If you’re in the Sunderland area, head to The Bridges for late night shopping as its a lot quieter than at the weekend. They’re open until 8pm on Thursdays at the moment and from 12th December, they’ll be open from 9am to 8pm Monday to Friday, Saturday from 9am to 5.30pm and on Sunday from 11am to 5pm, with FREE parking between 5.30pm and 9pm. What is top of your beauty wishlist this Christmas? What beauty gifts will you be picking up for your friends and family? 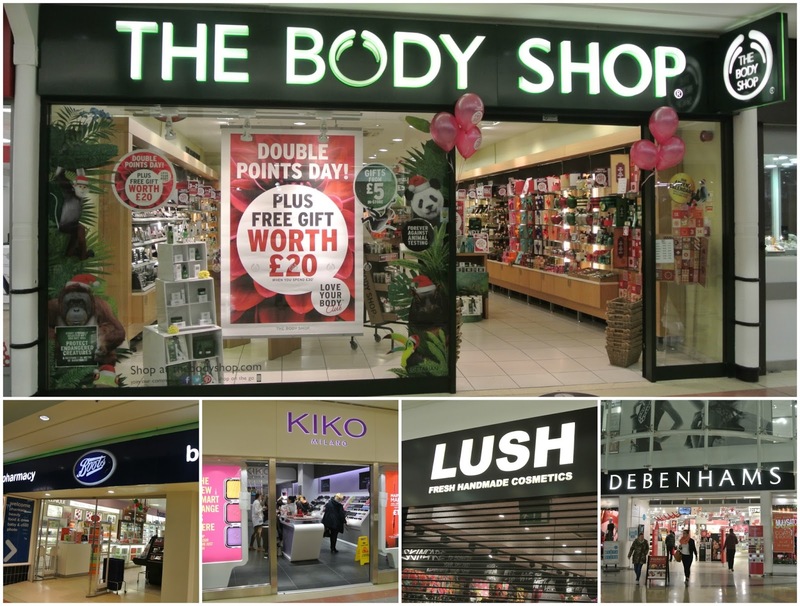 I used to buy in all of these stores when I was in London, here in Spain sadly we only have Lush, The Body Shop and Kiko, miss the deals both in Debenhams and Boots! We love a good wander around the shops too and love visiting our local shopping centre. Can't wait to visit over the Black Friday Weekend sales! Love LUSH too! Fab shop!I love The Body Shop and lush for the pretty packaging but Debenhams for my high end products. I definitely think that LUSH and Body Shop are high up on the list! Wow fab. I love all these shops especially Debenhams. So many fabulous shops all under one roof. You are spoilt for choice. All the brands that me and my sister love and can be found in oxford too, we are planning on having a day out to pick a couple of item from each of these stores (well except kiko as I am not sure we have it but will look). You really can't beat going into an actual shop and feeling and smelling the products. However I have a complete meltdown this time of year with all the people rushing around, so it's online all the way for me!! I can't wait to go Christmas shopping, and you've picked out some of my favourite stores here! Hi, I’m Katie, a reporter for SR News. Would I be able to use your photos in an article I am writing at the moment please? I will credit your work.